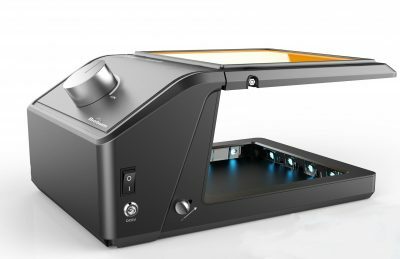 The Gel-Bright™ LED Gel Illuminator is a light-weight, non-UV lightbox for detection of fluorescently labeled nucleic acids and protein. This patented product possesses novel features enabling imaging performance superior to that of other LED illuminators on the market. The proprietary light source and unique filter mechanism ensure optimal excitation and clear visualization of both green and red fluorescent dyes. The Gel-Bright™ LED Gel Illuminator is optimized for detection of green dyes, such as GelGreen&reg; and SYBR® Green. It is also compatible with red dyes such as GelRed&reg;, ethidium bromide, and One-Step Lumitein™ Protein Gel Stain, however the sensitivity for the red dyes is not as high as for the green dyes. Other compatible fluorescent dyes are listed in the PI. The base of the Gel-Bright™ contains an array of LED lights around the periphery of the gel box, allowing for even illumination. Above the gel box is a mounted amber filter that allows the visualization of a fluorescent signal. The filter can be tilted to allow easy access to the gel for processes such as band excision, or lowered to allow the gel to be photographed. 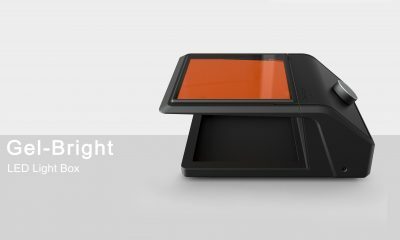 The Gel-Bright™ light box is ideal for visualizing and excising DNA bands from a gel, since unlike UV light, the LED lights do not cause damage to the DNA sample. The Gel-Bright is also safer for the user than a UV light box. When combined with non-mutagenic and environmentally friendly GelGreen®, Gel-Bright™ is ideal for educators and other users that prefer the safest elecrophoresis methods possible. The Gel-Bright™ LED Gel Illuminator is also the best light source for developing the staining of gels stained with the visible blue DNA gel stain DNAzure®. DNAzure® is a novel, visible blue DNA gel stain with extremely high sensitivity. After staining with DNAzure® the DNA bands first appear colorless , but then become dark blue after developing with light exposure. The benefit to using DNAzure® instead of fluorescent DNA dyes is that once the stain has developed, the DNA can be visualized by eye, without the need for imaging equipment. This is particularly advantageous for processes such as gel excision. SYBR is a registered trademark of Thermo Fisher Scientific. The Glo-Plate™ Blue LED Illuminator is a multi-functional blue LED light box. It can be used for photolysis of PMAxx™ or PMA in viability PCR. It is also an excellent way to develop the staining of gels stained with the visible blue DNA gel stain DNAzure®.